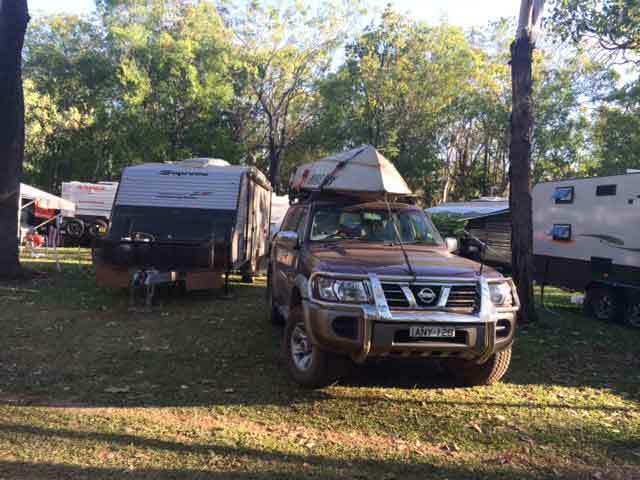 In early 2016 two of our neighbours, Bruce and Ruth, purchased a new 4WD caravan to replace their older one. One day when I was walking past his place walking Veto (our dog), Bruce told me about their next trip starting in early June which would take them from Sydney up through Queensland to the Northern Territory. Sometime later he told me that they were going to leave the 4WD and caravan in Darwin for a few weeks to return home and asked me if Kelly and I wanted to use them during this period. I discussed this with Kelly and it would fit in perfectly with her 40th birthday, so we could do the trip as part of the celebration. I later asked Bruce if the offer was still open and he confirmed it was and later again did the same. In the week before they left, he showed Kelly and me over the van and the 4WD so that we would know how everything worked. 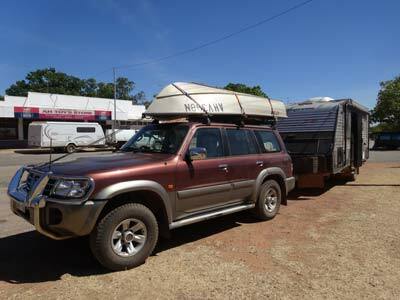 The 4WD is a Nissan Patrol top of the range, not sure of the year, but I would guess at about 2006 or so. It is the petrol version, 4.8 litre straight six. The caravan was a Supreme Territory. We booked flights to and from Darwin using frequent flyer points. Bruce and Ruth came back about five days before we were due to depart and handed over the keys and all relevant information. We have a very early start of 4:00 am and leave home at 4:45 am and drive to the airport. Our flight is at 6:30 am to Brisbane where we have a connecting flight to Darwin at 9:40 am. There were no direct flights available using frequent flyer points. We arrived in Darwin at 1:20 pm (NT is 30 minutes behind Sydney). We find the Patrol in the long term parking area and load our bags aboard. Our first task is to find a shopping centre to get food, beer and wine. We have to drive south to Batchelor which is close to 100 kilometres away. We stop at the Karama Shopping Centre where there is a Woolworths, a hotel, liquor store and more. We purchase our food suppliers for the next 10 days (7 nights of dinners) and most of our lunches, all our breakfasts. This cost $328, a lot more than it would in Sydney, but we also over purchased some things. I got some wine, sparkling wine and beer from the liquor store and hotel ($173, got ripped off at the liquor store I later realised as they did not give me the advertised discount). We got onto the Stuart Highway which runs south from Darwin to Alice Springs and then onto Port Augusta in South Australia, a distance of 2,834 kilometres. We have driven on sections of this south of Alice Springs in 2010. We arrive in Batchelor, which is just off the highway, at 4:15 pm. The caravan is stored at the Batchelor Caravan Park, parked behind the office. We pay for two extra nights (it is paid till tonight by Bruce and Ruth) and move the van to the designated spot. This is a bit of a tight squeeze to get into, but not too bad. Once set up, we unload our food into the fridge and cool down some beer and wine. This is a nice place, with lots of trees, grass and birds. We start to work out everything about the van (we do not really, some things we only figure out the last day). 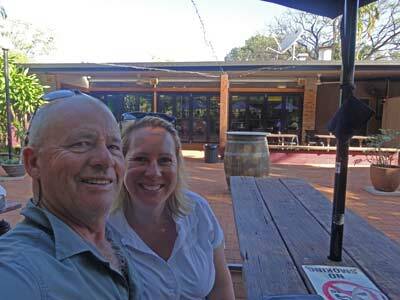 We are invited to drinks with the neighbours who are all from the Kurri Kurri area of the NSW Hunter Valley. There are about five or six couples travelling together. After this we cook a dinner of rissoles and salad. Today has been warm and sunny, and even now as we go to bed at 9:30 pm, it is in the high 20s. We get up at 8:00 am and after a leisurely breakfast, we head off for Litchfield National Park at 9:05 am. The main aim for the next few days is to explore the national park. On the way to it (via a very good tar road), we stop off at Rum Jungle Lake South for a look. This is where uranium was mined from 1953 till 1971. 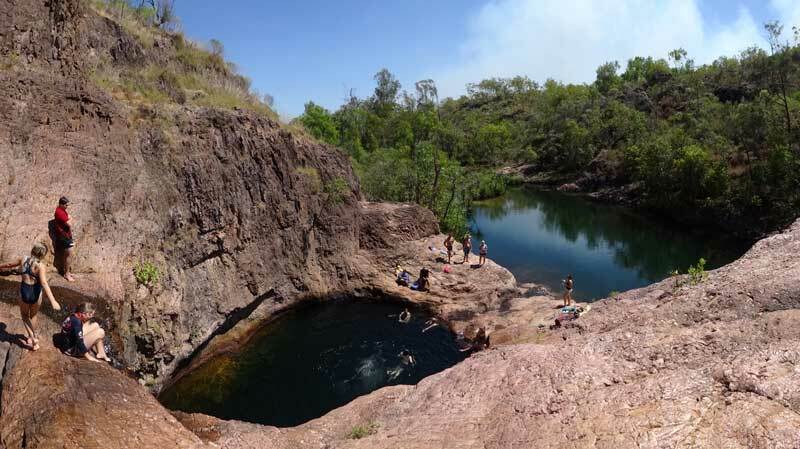 After the mining finished, the hole became a lake and is now used for recreation, including scuba diving. This last reason was why we came the couple of kilometres off the main road. There used to be a camping area here, but this is now not permitted, a pity, as it is a nice spot. 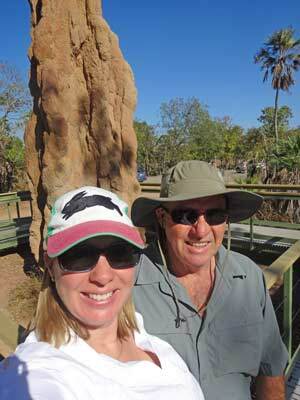 Once we enter Litchfield National Park, we stop at the magnetic termite mounds. This is a special parking area, with interpretation material about the mounds. 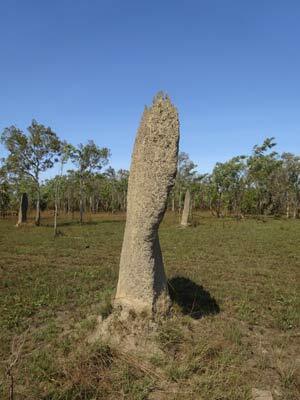 These are not the biggest or best termite mounds we have seen, but we stop anyway. It is 39 kilometres to here, including our diversion to Rum Jungle. After a short stop, we head back off and at 10:10 am we arrive at Florence Falls, one of the most popular sites in the park. There are also a couple of camping areas here, a 2WD one and a 4WD one. We do not look at them, but they are well situated. 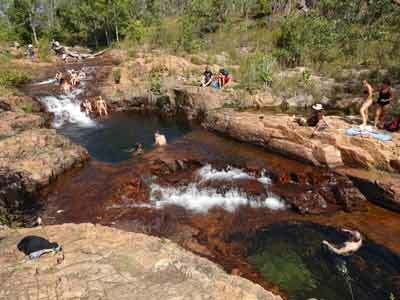 We park in the Florence Falls car park and walk the short distance down to the falls and pool. This is via a walkway and a set of stairs (138 I think). Wow, this is a brilliant spot. 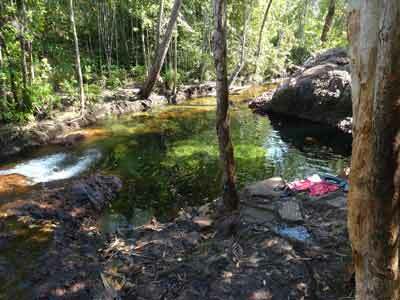 There is a large pool at the bottom of the small falls where you can swim. We change into our swimmers and have a very refreshing swim. I go over to the falls and swim behind the waterfall itself. I can look back out, a lot like you see in old Tarzan movies. 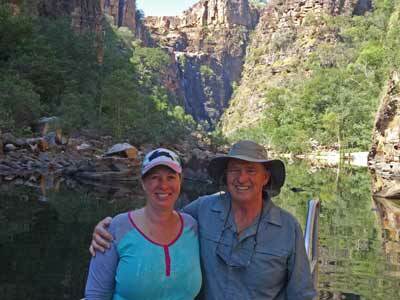 We leave and walk back to the car and drive back a short way to Blueys Waterholes. 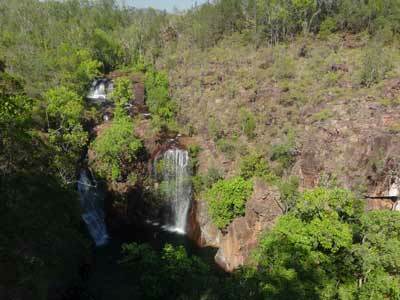 This is series of snall pools and cascades above Florence Falls. These are also fantastic. We have another swim in a few and I have a massage as the water tumbles onto my sore shoulder. We go back to the car and change back into our clothes at the very new changing room/toilet building. We head further into the park to Wangi Falls. This is 86 kilomtres from Batchelor, including the side trips we have done. We get there at 12:15 pm. We decide to have lunch which we made before we left the caravan park. We still on a large seat near the parking area. Again, this is a very nice spot, with a cafe, toilets and shop/information centre. After lunch we change into our swimmers and walk the few hundred metres to the very large pool at the bottom of the falls. This is by far the busiest of the spots we have been to today, with hundreds of people around. However, it is not too bad. This weekend is a long weekend in Darwin as the Darwin Cup horse race is on next Monday. This means there are probably a lot more people from Darwin here. We enter the water and walk and swim out to the middle. By now it is probably 33ºC, so the water is very welcome. The pool has some very sallow spots out in the middle, but also some deep spots off to the sides. We leave at 1:45 pm and have a look at the camping area as we head out. This is the only camping area in the national park which caters for caravans. Originally I was going to stay here two nights, but Kelly's Dad, Tomas, talked me out of it as he reckoned the road in and the camping area were not very good. I must disagree with him, we should have come here with the van to spend tonight and tomorrow. We go six kilometres further along the main road to the Cascades. We do the walk to the Lower Cascades where we have another swim. The walk is not hard, but it takes probably 25 minutes each way. We leave at 3 pm and try to get an ice cream at the nearby caravan park (there are two commercial establishments here outside the park). However, the kiosk is not open. We had previously tried to buy one at the Wangi Falls cafe, but it seems they shut up early when they ran out of most things. We drive back to Batchelor. We go into the town to check out where the toilet dump site is (we saw a sign on the way in yesterday). We found it, next to the Rum Jungle Tavern. We go in there for a beer. Not too bad a pub, with a nice beer garden. We stop at the petrol station on the main road which is 12 cents a litre less than the one in the town centre. We fill up, taking 55.5 litres at $1.279 a litre, $71.02. The car has done 316 kilometres since Bruce refuelled it, meaning we got 17.5 l/100 km. Back at the caravan park we extend for another night and then have a shower. We have sundowners outside the van and Kelly later cooks veal tortellini with a creamy carbonarra sauce. We head to bed about 9:30 pm. 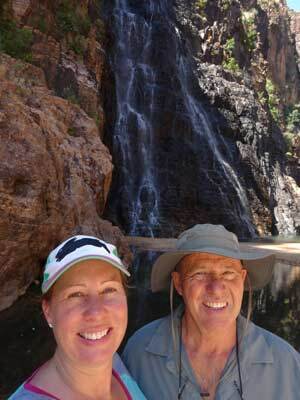 We get up at 8 am and after breakfast, we leave at 9:05 am and go back out to Litchfield National Park. We go to Tolmer Falls which we had passed by yesterday. The short direct walk to the falls is closed as the path is being totally redone to make it wheelchair accessible. We take the longer, but in fact, more scenic track. This is very easy and quite flat. It takes 50 minutes to do the walk and return to the car park. The walk comes to the falls from above the falls, there are great views as you approach the viewing platform. The falls drop a long way into a pool and there is an archway above. The viewing pltform gives great views of the falls and the land to the west and south. There was not much water coming over the falls, but better than nothing. From here we headed further into the park and then took the gravel Litchfield Daly River Road (four wheel drive only) to the south which goes to a number of places in the park and then out the park to Daly River (or back to the Stuart Highway). We first go to Surprise Creek Falls. First we have to cross the Tolmer Creek which is not too deep and then later another longer, sandy river crossing. This is the Reynolds River East Branch, you need to follow it downstream for about 50 metres before exiting. The depth was about 0.6 metre. We took a detour around an even deeper section. There is one shallow crossing of the Mistake Creek as well. The track is pretty rough, we can only do about 20 km/h in spots. 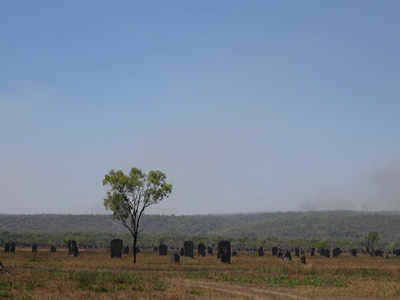 There are lots of magnetic termite mounds, especially in one place on an open plain with grass. These are more like the ones you normally see shown on television, very narrow and like a blade (whereas the ones we stopped at yesterday are more like a star picket). Very spectacular. 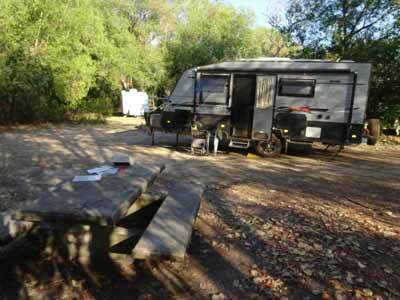 It is 27 kilometres from the main park road to Surprise Creek. There is a very nice camping area as well. Once we arrive we walk to the falls. It is about 300 metres or so, an easy walk. There is a huge deep pool at the bottom of the falls which are really a series of falls which drop into a couple of pools on the way. In the middle there is a very deep pool and above that another one. There is one more a bit further along the creek above that one as well. There are quite a few people here as it is a long weekend in Darwin and lots of people seem to be "locals". 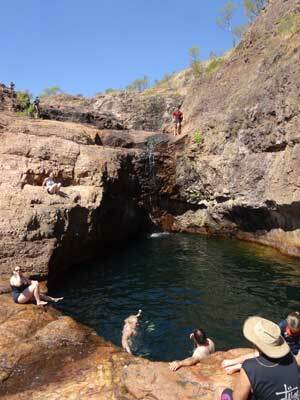 We have a swim and then jump a few times from the rocks above the middle pool into this deep pool. Very refreshing! After 30 minutes or more here, we head back to the car park and have lunch. After lunch we drive back towards the main part of the park. The road into Sandy Creek Falls is closed for some reason so we cannot go there. We head into Blyth Homestead which is back before the first water crossing we did this morning. Close to the homestead we have to cross Tolmer Creek again, this is quite easy, but you cannot see the exit as you enter. This old homestead was built in 1928 to house people when mining tin here. The homestead is very original and very basic. After this we head back to the Litchfield Park Road and back towards Batchelor. 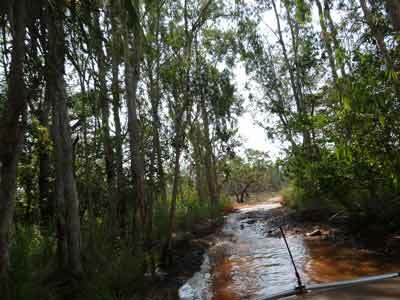 We go to The Lost City which is 11 kilometres of gravel road, very rough in spots. It takes 25 minutes to travel the 11 kilometres. Like the Lost City at Lithgow and the similar formations at Mudgee and Tenterfield in NSW, these are pagoda rock formations. They are a very interesting place and well work visiting if you have a four wheel drive. We do the short walk around and through the rocks. The track weaves in and out of the rock formations, with lots of narrow canyons and even tunnels to walk through. These are probably better than the pagodas at Lithgow and Mudgee and equal to the ones at Tenterfield. After the walk we head back to Batchelor. We go back to the petrol station and again fill up. This Nissan is a bit thirsty and tomorrow we have a little distance to travel to where we can get fuel (remember the fuel guage is not working). We take 37.2 litres at $1.279 a litre, $47.58. We did 200 kilometres toda, so we averaged 18.6 l/100 km. We go to the caravan park, have showers, sundowners and dinner. Another early night. We get up at 8 am and after breakfast leave at 9:05 am. We stop off at the toilet dump spot which is right near the hotel. Here we dump the caravan's toilet. We head back to the Stuart Highway and head south. The speed limit is 130 km/h but we sit on 90 km/h. There is not much traffic in our direction yet, so we do not have too many people catching up to us. There are plenty of old World War II airstrips along here, you can still see the very flat dirt runways on the side of the road. 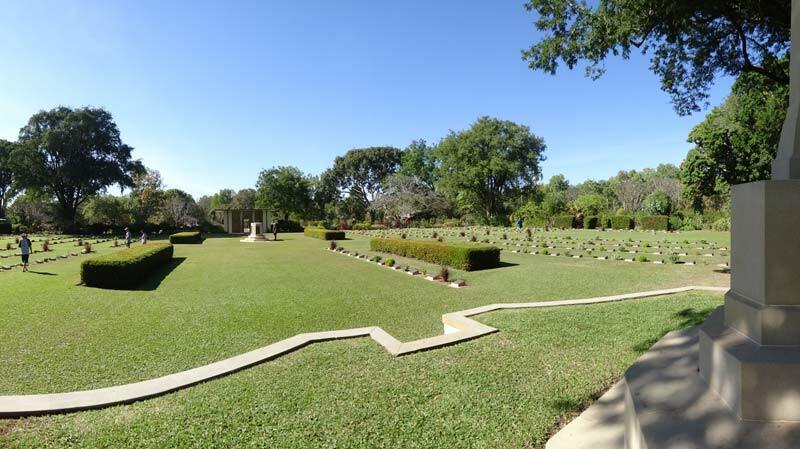 It is 44 kilometres to Adelaide River and we divert off the highway here to visit the Adelaide River War Cemetery. We get there at 9:40 am. This has the remains of many of those killed in the bombing of Darwin as well as some Navy personel and even some Japanese shot down during the attacks. It is kept in beautiful condition and I recommend a visit. We leave at 10:20 am and once back on the highway continue south. We stop at a rest area at 10:45 am for morning tea (about 25 kilometres from Adelaide River) and leave 15 minutes later. At noon we arrive in Pince Creek. This small town is just off the highway. We stop to refuel (43.43 litres at $1.249, 158 km, average 27.5 l/100 km). We also buy some bread and a carton of beer (Coopers Pale Ale at a reasonable $52). 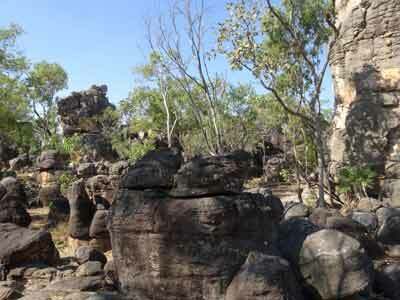 We are back on the road at 12:25 pm and take the Kakadu Highway which heads north and east. At 12:45 pm we stop at Harriet Creek Rest Area for lunch. This is 27 kilometres from Pine Creek. It is very hot now, 31ºC. It is a very crappy rest area! We have lunch and leave at 1:10 pm. About 20 kilometres along there is a golf course called Moline. Amazing since it is 47 kilometres from the nearest town. 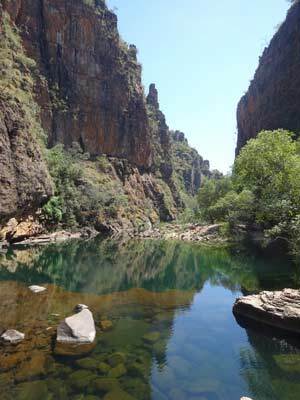 We cross the Mary River and enter Kakadu National Park. There was a national park visitor centre at the roadhouse but it is closed, not sure if this is permanent. At 1:50 pm and 80 kilomtres from Pine Creek we come to another visitor centre, this time inside the park. We stop here to pay our park use fees but discover it is also closed and appears abandoned. How the hell do we pay our fees? Another 25 kilometres along we come to Bukbukluk Lookout. We stop here and walk to the lookout. It is not the greatest view, but there is some nice scenes to the north. 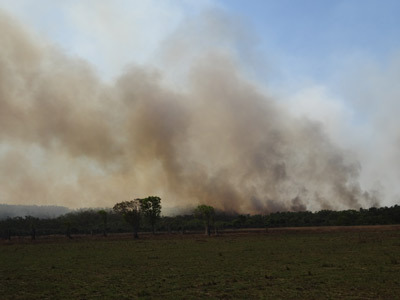 There is a fire here to the east of the highway, but while there is a lot of smoke across the road, it is not dangerous. At 3:25 pm we arrive at Mardugal Camping Area. This largish camping area is suitable for caravans and motorhomes (most in the park are not). The best spots in the caravan/motohome area are taken, but we find a reasonable spot where we have some shade from the sun. We are going to be here for two nights, so we set everything up. We have a table and firepit, not that we will need to use it. While the better spots have a grass base, we have dirt. I work out I can pay the park use fee via the internet ($80 for 4 days), so I do this, but it was very difficult with the web site not working very well despite me having perfect mobile phone coverage. However, I cannot figure out how to pay the camping fees as there is nothing on the notice board at the toilet/shower block to say. I later learn from another camper that someone will come around later and collect the money. Sure enough, later someone comes and gets our money, $40 for 2 nights, but it should have been $60 but they only had an old receipt book! I drive to Cooinda (not too far) to refuel as tomorrow we have a long distance to travel to Jim Jim Falls and Twin Falls returning to here. We have travelled 168 kilometres and used 40.7 litres. The petrol cost $1.489 a litre. We have averaged 24.1 l/100 km since Pine Creek. Once back we have showers, then sundowners. Kelly cooks chicken enchaldas for dinner. 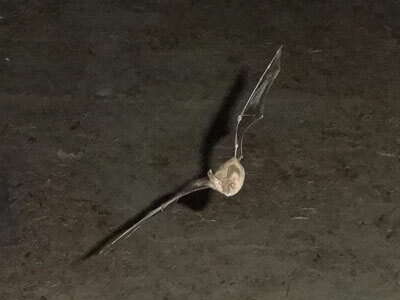 We sit outside and after dark a small insect eating bat starts circling the caravan. It goes round and round the va, five seconds a lap. It is after the insects that are been attracted to the outside light of the van. I try to take a photograph from side on but can never time it right. I set up at the end of the van and finally get some good shots as it approaches me. We go to bed at 10 pm. Quite a cool night with a very clear sky and lots of stars. We get up at 0800 and have breakfast. 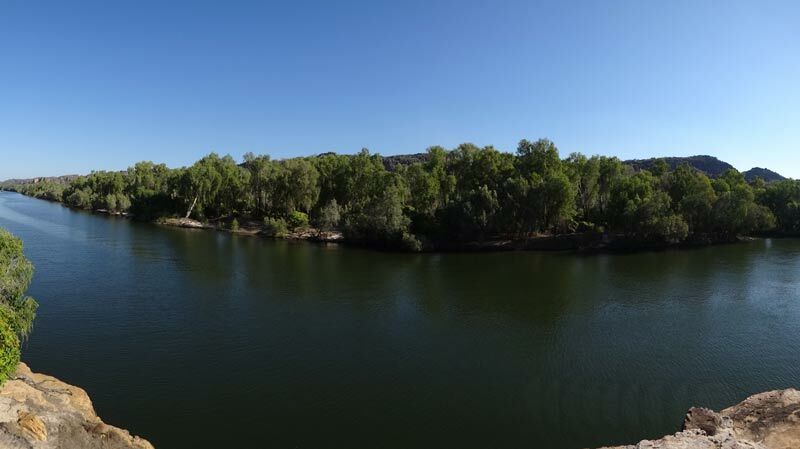 We ring the visitor centre (the one near Jabiru) to ask about how to get tickets for the Twin Falls ferry (you can only get there from near the car park by boat). We find out we can pay there ($12 they say). We head off at 9 am. It is 8 kilometres to the turn off. 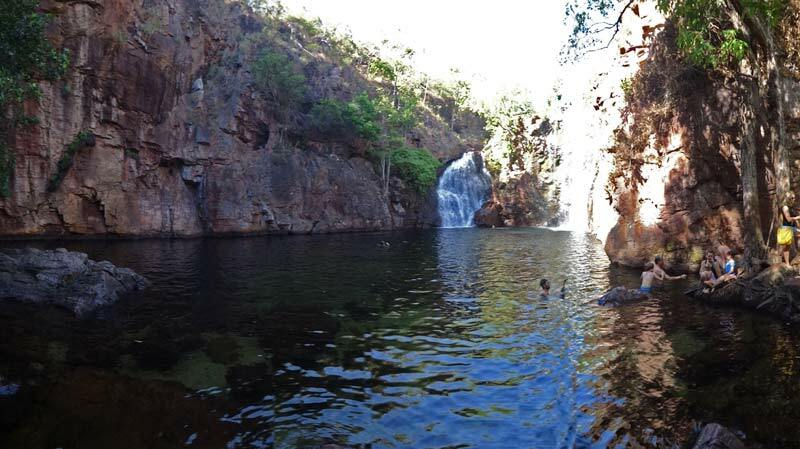 There is no indication at all at the turn nor along the road that while you could take a two wheel drive vehicle along the main part of the road, that you must have a proper 4WD to access Twin Falls and Jim Jim Falls. Anyway, we head down the gravel road, one of the worst I have been on in the past 15 years. It has the worst corrugations you can imagine. At times we have to slow right up, but sometimes speed makes them better. We pass by the nice camping area at the end of the main part of the road (61 kilometres from the highway) at 10 am. We continue on towards Twin Falls. We have to cross Jim Jim Creek via a causeway. However, the water is quite deep, probably at the bottom of the Patrol's bonnet. Again, I have never seen this mentioned anyway. We arrive at the car park at 10:45 am, having taken 45 minutes to travel 15 kilometres. We walk about 300 metres to the ferry location. This is a small punt like boat that takes you about 600 metres up the Twin Falls Gorge to the start of the walking track to the falls. They charged us $12.50 rather than the $12 we were told it would cost, not sure if they are ripping everyone off as the ticket they give you has no price on it. This is a very specatular gorge, with nice views of the falls ahead. There is a bit of water flowing over the falls, but at the start of the dry season it must be amazing. It is a short walk to the base of the falls. Part of this is along a floating walkway, sort of like a floating wharf. This has some hand pumps so you can cool yourself down under a shower if you get too hot. We certainly use them on the way back. 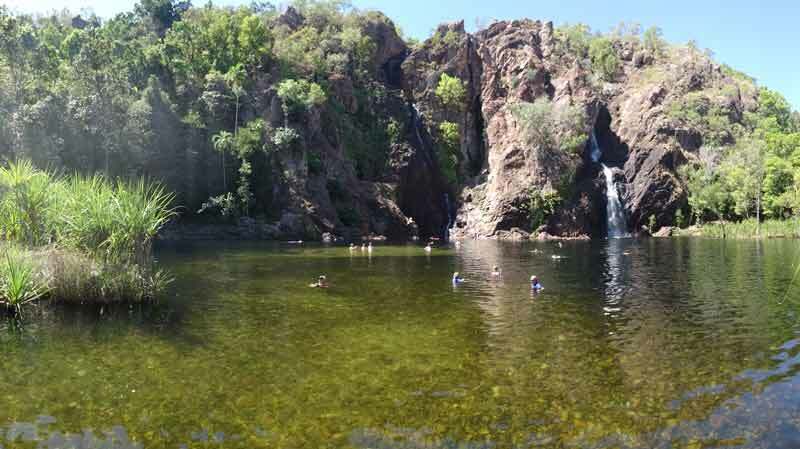 You are not allowed to swim here for cultural reasons, as well as the fact that there could be saltwater crocodiles in here, the water is quite deep so they could have evaded the attempts to catch and relocate them that happens at the start of the dry season. 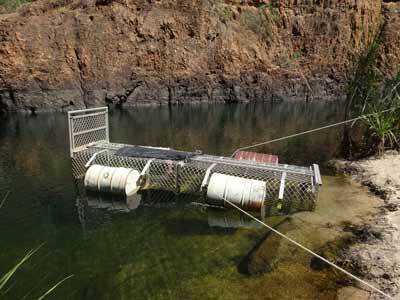 There are a number of crocodile traps in the water way. After spending 30 minutes or so at the falls, we walk back to the ferry and catch it back to the other end of the gorge. By the way, you call them on a radio when you are ready to be collected. Back at the car park we again cool down with some water from a rain tank. It is over 30ºC. We leave at 12:35 pm and drive the 9 kilometres to Jim Jim Falls (partly back the way we came). At 1:15 pm we have lunch in the car park and then walk to the falls. It takes about 40 minutes and is a rough track with a bit of a scramble over large rocks at the end. However, it is worth the effort. There is little water coming over the falls, but the huge pools are stunning. You can swim here, so we change into our costumes and have a very refreshing swim. We start off in the main one and then swim over to the second one. This pool has a very private beach and some rocks to rest on and there is a group having lunch here. We do not go to the one straight under the falls as it will take a bit too long to get there by scrambling over the rocks in between. If we were camped at the camping area, I would spend one whole day here I think. We spend almost an hour here, swimming the whole time. We walk back to the car park and leave at 3:25 pm (see the day is rapidly diminishing). It is very hot now, 37ºC according to the car temperature guage. We stop and look at the camping area ($15 per person per night) and then suffer the corrugations again for over 60 kilometres. We drop into Cooinda so Kelly can see it (a small resort, fuel, airstrip) and then go back to the camping area, arriving at 5 pm. A long day! We have showers and then sundowners, the beers are certainly welcome tonight. We have lamb and salad for dinner. The bat comes back again, keeping us entertained. We go to bed at 10 pm. As normal we are up at 8 am. We heave breakfast and then get the van ready to depart. 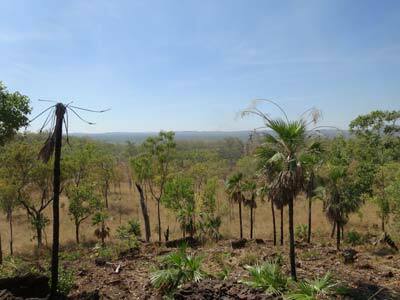 We leave at 9:20 am and head north again along the Kakadu Highway. 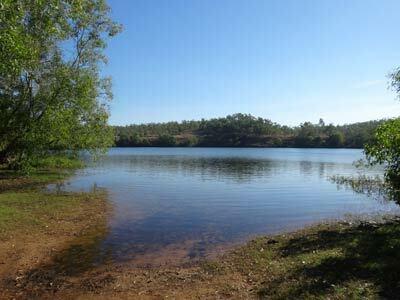 This morning we will do some sightseeing on the way to our overnight camping spot near the East Alligator River. We turn off the highway and head to Norlangie Rock. This is not too far off the highway and is a spot I visited back in 1998. It is 34 kilometres to Norlangie Rock and we arrive there at 10 am. 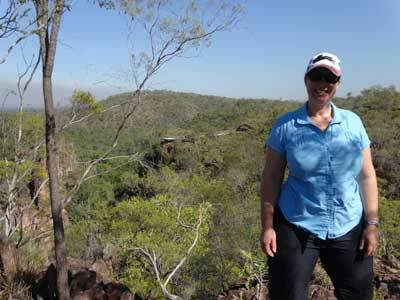 We do the walk around the Aboriginal art sites, very easy and lots to see. It is again hot and despite a lot of the walk being in the shade of the rock and caves, we are hot and sweaty. There are also some excellent views as well. 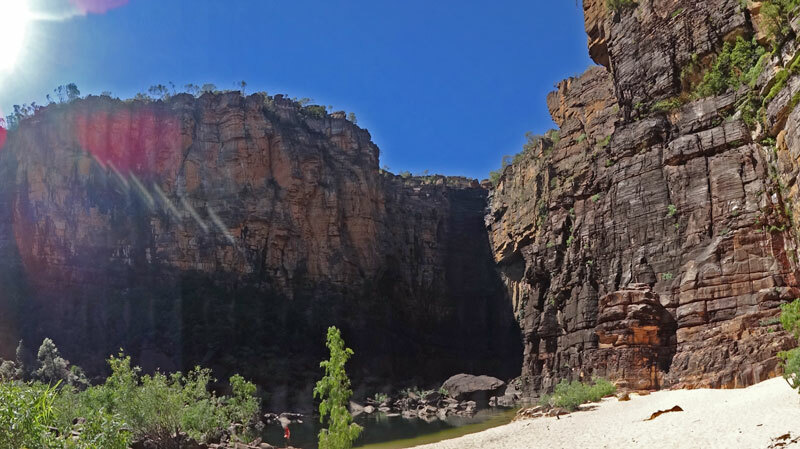 I strongly recommend this as one of the highlights of Kakadu National Park. We leave at 11:20 amd a drive to the township of Jaburu which is inside the national park (as is the Ranger uranium mine!). We get there at 11:50 am and go to the petrol station to refuel (57.6 litres @ $1.39, 253 kilometres gives 22.8 l/100 km). We also go to the supermarket to get some bread, rolls, soft drinks and crackers. 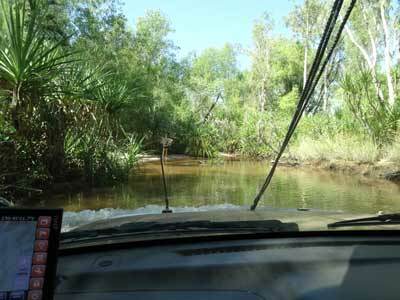 We take the road out to Arnhem Land and at 1 pm we arrive at the Merl Camping Area at East Alligator River (43 kilometres from Jabiru). We do a couple of rounds of the camping area (there are two but only one is open) before we decide on the spot we will take. The spots take one or two cars with vans etc, although some may be bigger or smaller. We are close to the shower block as well. We set up the van and at 1:30 pm we head off to the Corner Store. This small shop sells food (Thai, chips, burgers) but no goods. It also sells tickets to the boat cruise on the East Alligator River that we want to do. We order some spring rolls and hot chips and buy our tickets for the 3 pm trip ($76 each). The Thai food looks and smells great, the hot chips were also really good. We go back to the camping area and moved the van from the spot we originally picked to a better one. The camping area caretaker comes around and collects our fee ($60 for two nights). He also gives us some tips about the best place to see crocodiles. We go to the boat ramp where the boat tour starts from. This operation is owned by the local Aboriginal community and all employees are Aboriginals. There are so many people they use both their boats. 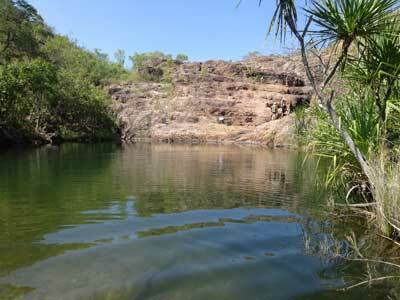 We first head downstream to the causeway that crosses into Arnhem Land. This is called Cahills Crossing. On the way we see dozens of crocodiles, some are huge. They are swimming in the river or lounging on the mud flats on the side. Occasionally one will just sink under the water, you cannot see it at all, even though it is only a few inches under the surface as the water is very dirty. From the crossing we head up river past the boat ramp. 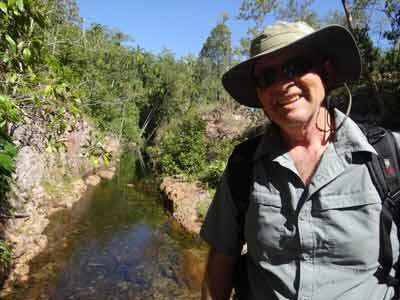 There is a good commentary about Aboriginal lore, nature etc by the guide as we go. There are lots more crocodiles. When I did this cruise back in 1998, I reckon I only saw perhaps a dozen crocodiles in total. I give up counting at 60. 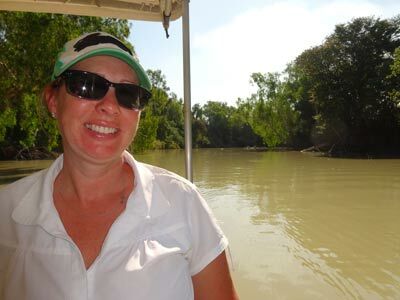 Further up the river we stop on the Arnhem Land side and go ashore. 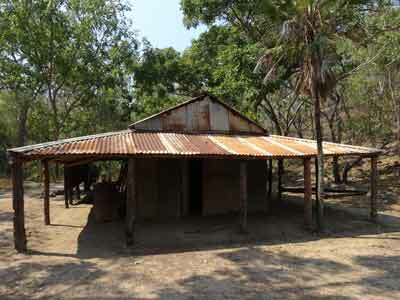 Normally you are not permitted in Arnhem Land unless you have a permit, but as we are part of the group it is permitted. There is a display of spear throwing using a woomera. The guide can easily throw the spear right across the river, at least 100 metres. 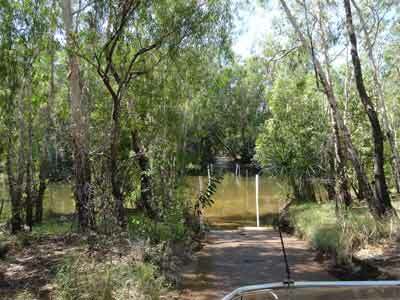 We head back to the boat ramp and then drive back to the camping area, arriving at 5 pm. The cruise is relatively expensive, but it is excellent. We have showers and some beers and then dinner. Tonight there are lots of insects around, including mozzies, but we are prepared. We head to bed at 10 pm. We are up at 8:15 am, it was a very hot night with some wind and smoke. We have breakfast and leave at 9:15 am. 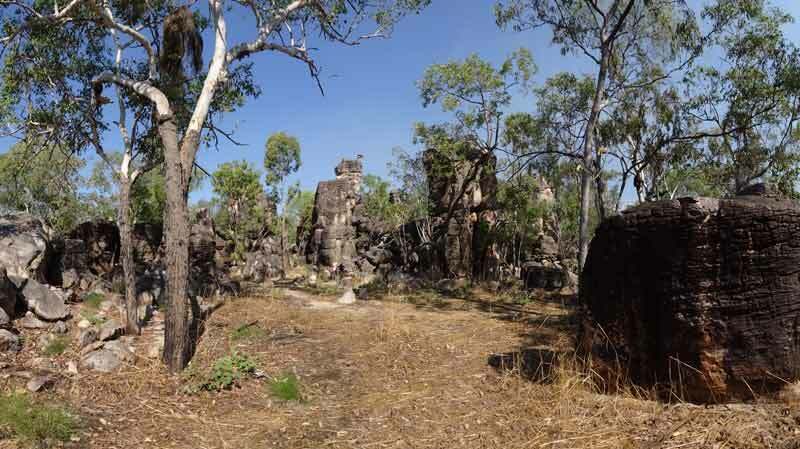 There is a free guided tour of the Ubirr Aboriginal art site at 9:30 am. It is only five minutes to the car park. There are lots of people on the tour, but the guide, Annie, is excellent and handles the large number of people so that we all get to hear her. The tour was fantastic, with great explanations of the art and Aboriginal history of the area. The art here is possibly the best I have seen anywhere. 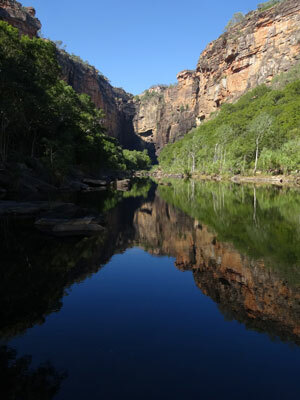 A must see place if you come to Kakadu and also see if you can get on a guided tour. We spend about three hours here. At 12:35 pm we drive to Cahills Crossing and walk from the car park to the crossing. 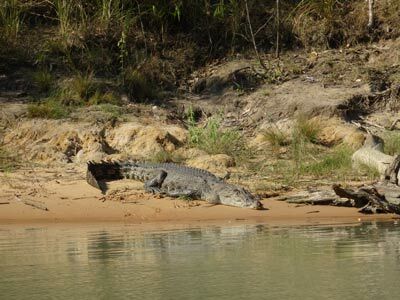 Yesterday the camping area caretaker told us that at high tide, the crossing is the place to see crocodiles. Below the causeway is tidal, well at least the tide slows the outflow of water, causing it to bank up and overflow back into the upper part. When this happens, crocodiles wait at the crossing for fish (mostly barramundi) to come over the causeway. They certainly are getting a good feed. 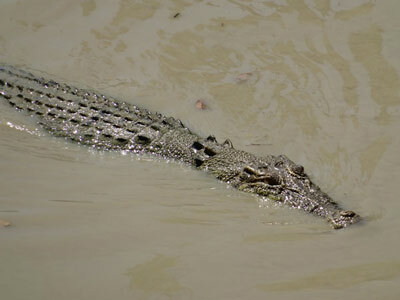 We see about 14 crocodiles at a time, although there are certainly more, probably at least 20. Some are huge, at least 3.5 metres. Some of the crocs are only centimetres from the causeway, lying in wait for fish. We leave at 1:10 pm and go back to the camping area. We have lunch and then read for a while. 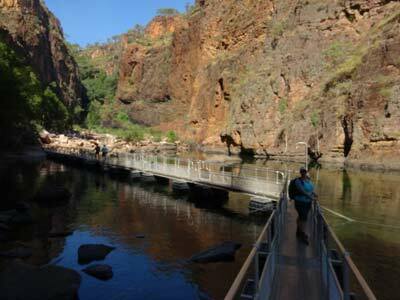 At 3 pm we drive the short distance to the Bardedjilidji Walk which is back near the boat ramp. 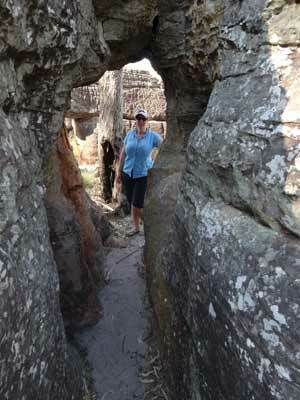 We do the very easy walk which goes in and around the rocks which are a sort of pagoda like The Lost City in Litchfield National Park. There is also some art work. We leave at 4 pm and go back to Cahills Crossing and get breath-tested as we enter the car park. There are 7 police and 5 cars! We assume this is really aimed at stopping people taking alcohol and drugs into Arnhem Land. There are no visible crocodiles now, but we are amazed to see fishers standing on the causeway within inches of where we saw crocodiles only a few hours ago. Idiots! We leave at 4:30 pm and go back to the camping area. We have showers, then sundowners. I cook a lamb shoulder for dinner with potato slices on the barbecue. It is much cooler tonight, but still heaps of mozzies. We have dinner with a bottle of French champagne Kelly got for her birthday. An excellent dinner to finish our time in Kakadu National Park. We go to bed at 10 pm as normal. We get up at 8:30 am. I did not sleep well as I have had a sore shoulder for the past week and last night it was even worse. Kelly also did not sleep well due to my constant moving. We have breakfast and pack up, including washing the very greasy barbecue! It is warming up quickly and when we leave at 9:40 am it is 25ºC. We drive back to Jabiru and dump the toilet's holding tank at the dump site on the main road into the township. We then head off towards Darwin on the Arnhem Highway. On these roads we sit on about 90 kmh rather than the 130 speed limit. We stop 33 kilometres along at the Mamukala wetlands for morning tea (10:45 am). We do a shore walk out to the viewing platform where there is an excellent interpretation display. We see lots of finches and some magpie geese. We leave at 11:15 am. At 12:30 pm we stop at the Mary River Rest Area for lunch. 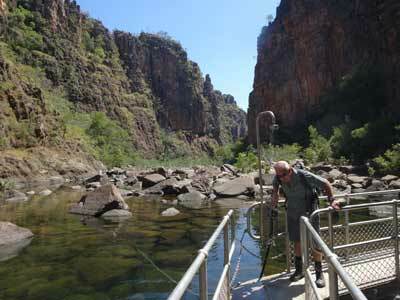 This is the same river that we crossed last Sunday at the southern end of Kakadu. We have travelled 186 kilometres this morning. This is a nice rest area. We leave at 1 pm. Just before 2 pm we turn onto the Stuart Highway and then stop at a petrol station for fuel. We have travelled 340 kilometres since refuelling and 270 kilometres today. We are back on the road as soon as we refuel and at 2:30 pm we arrive at the Discovery Parks Caravan Park at Winnellie. This is opposite the Australian Heritage Aviation Centre. We settle in and set up the van. Kelly washes the Patrol as it is filthy, this takes her two hours. We have showers and at 5:45 pm we drive to the Mindil Beach Markets. These are on every Thursday and Sunday evenings in the dry season. There is a huge crowd here, but we find a parking spot fairly easily. We walk through the markets, checking out the various food options. We end up buying a mixture of things and then go to the beach to watch the sunset (as does nearly everyone else). We have a beer and some wine with the food. A nice way to end the day. We later walk though some of the other stalls and purchase a cute gecko shaped mozzie coil holder. We have an ice cream and then head back to the caravan park. We are back at 8 pm and have another drink or two before going to bed. Today we are doing some sightseeing around Darwin. First off we head to East Point and the Darwin Military Museum. This has changed dramatically since I was last here in 1998. It is a really good museum about the bombing of Darwin as well as the military build up before and after the bombings. We spend about three hours here. After this we go to the Museum and Art Gallery of Northern Territory. This is not far away. This has free entry and has an excellent display on Cyclone Tracy which almost totally destroyed Darwin on Christmas Day 1974. 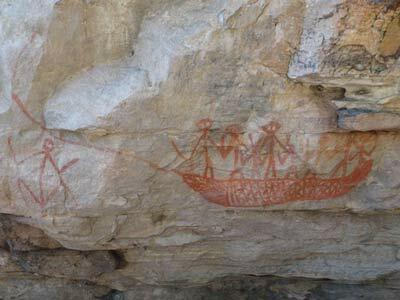 There is also a huge amount of Aboriginal art, lots of stuff on native fauna, fish etc, including the remains of Sweetheart, a huge five plus metre crocodile. After spend almost two hours here, we go to Cullen Bay Marina where we have lunch at Lola's Pergola. We have some very nice pizzas. This place has an interesting men's toilet, as you stand at the urinal, you can see out through a one-way mirror into the main restaurant area! From we head to the docks area for a look around. We also have a look at various marinas as we may sail our yacht Catlypso here in 2018. 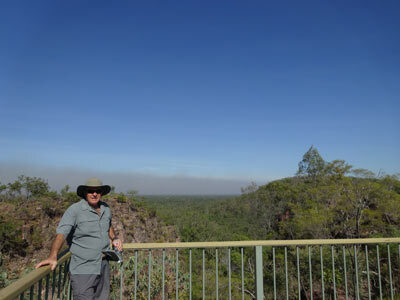 We then go to Charles Darwin National Park. Here there are lots of World War II explosive storage bunkers. In one there is a small display about them. There is a park as well with nice views back to Darwin. We then go back to the caravan park for a rest up as we are going out to dinner tonight. I have made arrangements to meet Chris Duncan who I went to school with from kindergarten and even knew him for a few years before this. Chris's parents were my parents best friends and our Dads played golf virtually every Saturday for 30 plus years. I have not seen Chris for about 15 years and Kelly, of course, has never met him (his sister Therese is one of our family's closest friends). We drive to the Beachfront Hotel at Rapid Creek which is near where Chris lives. This is a nice pub and we have dinner here and quite a few drinks. It is great to catch up with someone I have known for almost 57 years. We have a great night, I am so gald we met up. Kelly of course drives us back to the caravan park. Everyone this morning is complaining how cold it is, apparently it is the coldest Darwin night for 15 years or so. I head over to the Australian Aviation Heritage Centre which is across the Stuart Highway and a few minutes walk away. Kelly does not want to come, so stays and cleans the van a bit. The centre has some amazing aircraft, including a Boeing B-52 bomber and a General Dynamics F-111. I spend almost two hours here before heading back to the caravan park. We have lunch and then head to the airport. We are leaving the van here for Ruth and Bruce to collect in a few days. I drop Kelly off at the terminal with the luggage and then take the Patrol to the long term carpark where I leave it. We catch our flight back home, this time it is a direct flight so it is a lot quicker. We arrive home, catch the bus to the long term car park and drive home. We have had a great 10 days, many thanks to Bruce and Ruth for offering us the use of their 4WD and van.